As federal, state, and local governments embrace the digital age, law requires online information and services to be accessible to all staff and constituents. But with the constantly evolving digital landscape, many governments are at a loss for how to incorporate accessibility into their digital strategy. What do governments need to know about digital accessibility and how can they stay ahead of the curve? According to a 2018 report by the Center for Disease Control, one in 4 U.S. adults – 61 million Americans – have a disability that impacts major life activities. That’s 25% of adults that require some type of modification in order to enjoy equal access to services. For years, accessibility was associated with physical spaces, and legislation mandated accommodations such as accessible wheelchair ramps and handicap parking for people with disabilities. However, individuals with disabilities are also affected by services beyond the physical realm, such as websites, electronic documents, multimedia, and social media. In 2019, “digital” is becoming the new frontier for accessibility. A 2017 study by the Information Technology and Innovation Foundation found that 85% of government sites are not ADA compliant. As a result, there has been a spike in lawsuits over the last few years due to digital real estate “so inhospitable it denies access”. But digital accessibility is more than just the law – it’s the right thing to do. Especially for government – an institution dedicated to serving the public – digital accessibility matters. It is pertinent that government services be accessible to the full public, not just the 75% of adults without a disability. 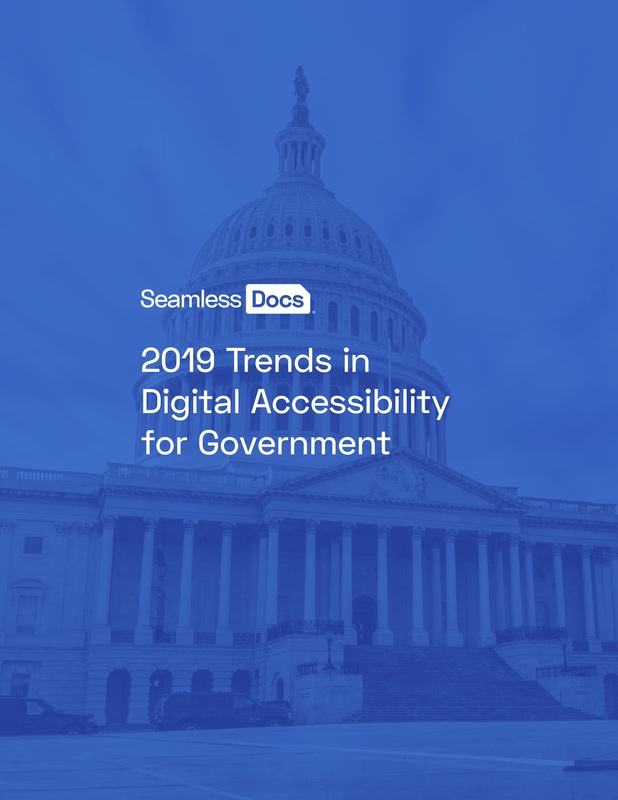 In an effort to consolidate resources and tips for governments to stay ahead of the curve, SeamlessDocs will be releasing a white paper: 2019 Trends in Digital Accessibility for Government. As the first comprehensive digital accessibility guide developed specifically for state and local governments, this white paper focuses on what you need to know about digital accessibility, how to overcome current and future challenges, and why your agency should care. SIGN UP HERE and we'll send you the white paper as soon as we release it, estimated May 2019.